A retired NYPD officer residing in Brewster has been found guilty of menacing for scuffling with a quadriplegic man while brandishing a handgun over loud music being played in his car. Mario Zeoli, 50, was found guilty of menacing and harassment&mda… Please login below or purchase a subscription to the Putnam County Courier to access this content. 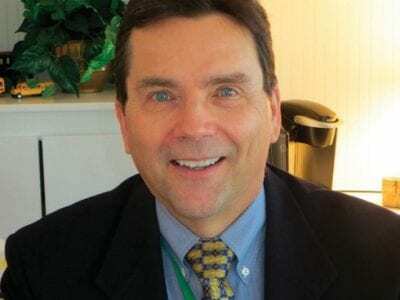 Tim Conway was appointed as Superintendent of Schools by the Brewster Board of Education Tuesday evening. It’s now official. After serving for five months as Brewster’s Interim Superintendent of Schools, Tim Conway was unanimously appointed the dist… Please login below or purchase a subscription to the Putnam County Courier to access this content. A Carmel woman is alive today thanks to the efforts of Yonkers Police and the administration of Narcan—a life saving spray that reverses an opiod overdose. Police would not reveal the woman’s identity, telling the Courier that she was 28… Please login below or purchase a subscription to the Putnam County Courier to access this content. 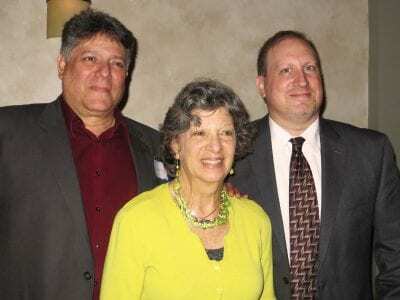 County Executive hopeful Sam Oliverio (left) joins Wendy Whetsel and Andrew Falk after being endorsed by the Putnam Democratic Committee to seek election this fall. 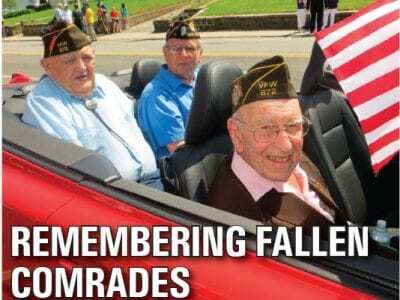 Putnam Legislator Sam Oliverio received the unanimous support of the Putnam Democrati… Please login below or purchase a subscription to the Putnam County Courier to access this content. A Lake Peekskill woman faces charges of violating New York State Election Law as well as the state’s penal code in connection with nominating petitions filed last year for the Putnam Valley town election. State Police Tuesday reported the arrest of … Please login below or purchase a subscription to the Putnam County Courier to access this content. 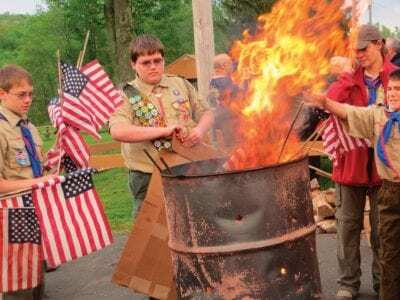 Boy Scouts “retire” American flags throughout the weekend. Fires burned brightly in steel drums at the Putnam Veterans Memorial Park throughout the holiday weekend to symbolize veterans’ determination of never having their park desecrated… Please login below or purchase a subscription to the Putnam County Courier to access this content. 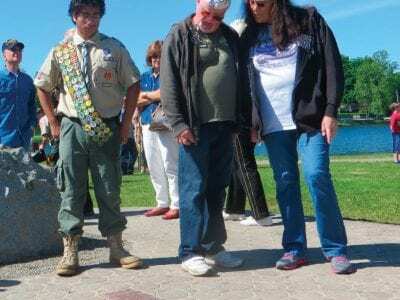 Carmel High School junior Arturo Torres received an ovation for his efforts on Memorial Day when his Eagle Scout project was unveiled in Lake Carmel. The 15-year-old has been a member of the Boy Scout movement since 1st grade, thanks in part t… Please login below or purchase a subscription to the Putnam County Courier to access this content. “Writers Read” is an afternoon of published work, and work-in-progress, read by members of Lake Writers, the writing workshop group at Arts on the Lake 640 Route 52,Carmel. Writers will read excerpts from novels, poems, short stories, sa… Please login below or purchase a subscription to the Putnam County Courier to access this content. QSY Society Amateur Radio Club’s June meeting will be held Tuesday evening, June 3, at the East Fishkill Community Library. This month’s topic is Field Day. Field Day is the single most popular on-theair event held annually in the USA a… Please login below or purchase a subscription to the Putnam County Courier to access this content.